Before our trip, when I thought of "Italian food," I tended to have a pretty narrow set of dishes in mind. But the reality is that Italy has only existed as a unified country for about 150 years. Because of this, there's a strong sense of regional identity, especially when it comes to food. Some things are common everywhere, like cured meats or pasta, but the menus change significantly as you travel through the country. Our journey began in Rome, and two of the specialties I wanted to try there were pasta all'amatriciana and pasta alla carbonara. I'd tasted carbonara once in South Carolina, and my carbonara-loving friend (who had been to Rome) said it was excellent--so I think it was pretty authentic. But I'd never even heard of amatriciana, and that's largely because one of its main ingredients isn't widely available in America. Pasta all'amatriciana features guanciale--pork cheek--and purists will tell you that substituting bacon is *not* acceptable. Testaccio, the pungent, blue-collar neighborhood, is in the heart of Rome and the birthplace of the rugged Roman Cuisine known as the quinto quarto (fifth quarter). From 1890-1975 Testaccio was home to the slaughterhouses of Rome. Here the meat was taken apart in quarters. Distribution went like this: Prime quarter went to nobility, second quarter to the clergy, third quarter to the bourgeoisie, fourth to soldiers. The “fifth quarter” of offal makes up about one-fourth of the carcass’s weight. These rejected nasty bits of heads, tails, hearts, lungs, glands, intestines, feet, and esophagus went to the average Giuseppe of Rome. Slaughterhouse workers also took parts of the quinto quarto home as part of their pay. The name quinto quarto was born along with an entire cuisine around offal. Offal. Awful? We were about to find out. 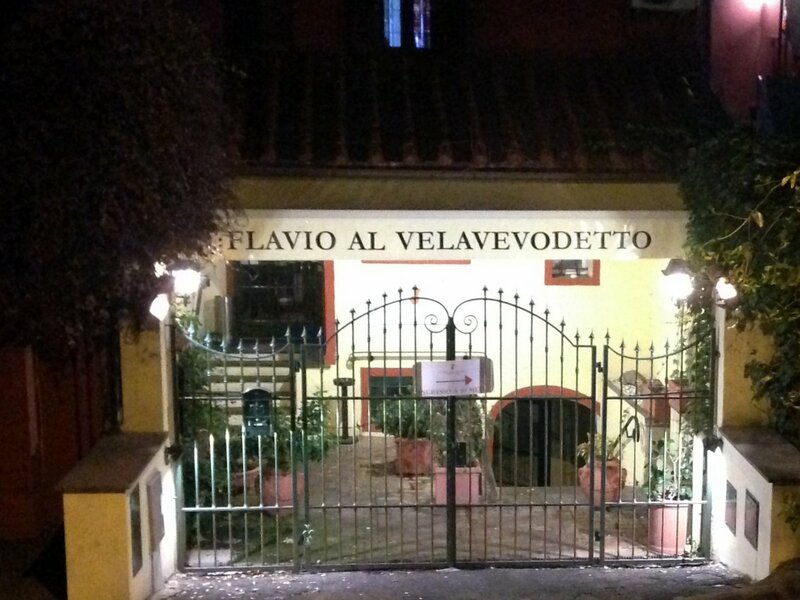 A restaurant in Testaccio called Flavio al Velavevodetto (ve l'avevo detto means, roughly, "I told you so") is supposed to be one of the best places to get Rome's offal dishes, so we set out for an adventure on our second night in the city. We waited until after 8PM to go, but the restaurant was still nearly empty. It wasn't until after 9:00 that people started flooding in. We knew Italians eat late, but seeing it night after night was a little mind-boggling. Even when we thought we were waiting until a "reasonable" hour, like 8:00, we'd still be the first ones there. At least this made it easy to get a table without a reservation most of the time. Food Lover's Odyssey has a post about Flavio with some interesting history and daylight pictures of the restaurant; I'll move right along to the food we ordered...and the disturbing experiences that had nothing to do with the food. Antipasto: Insalata nervetti con giardiniera fatta in casa. Giardinera fatta in casa, it turns out, are "homemade pickles." The carrots, zucchini, and cauliflower you see were crunchy and faintly vinegared. The rest of the plate? Think "hard meat gummies," sort of. 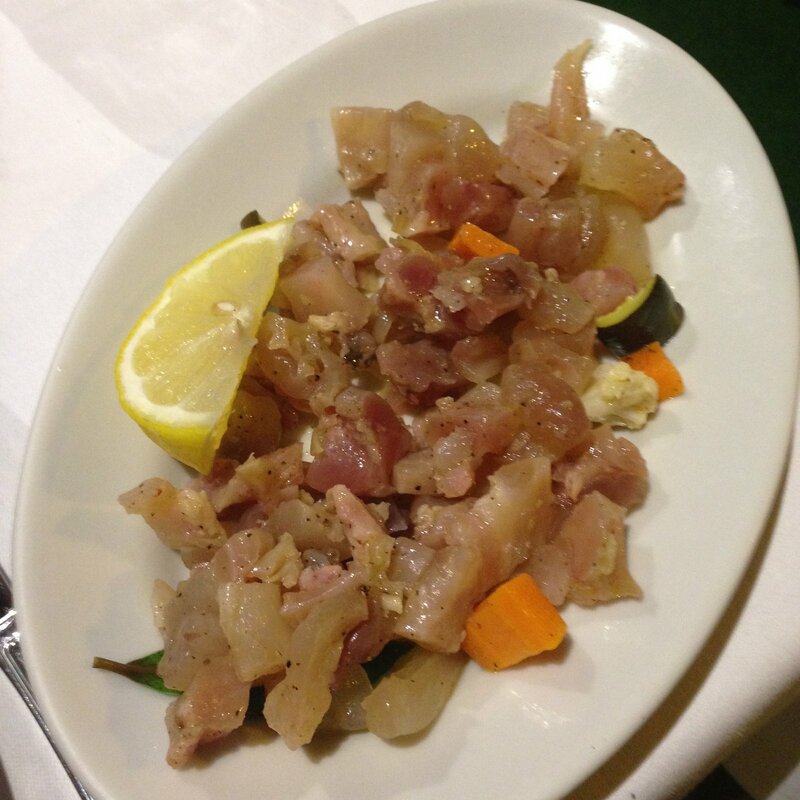 This blogger described Flavio's nervetti as "chewy meat nubbins"--that about captures it. After extensive googling, I am still not entirely sure what we were eating. I thought spinal cord, but some online info seems to suggest cartilage. At any rate, it was definitely a texture + flavor combination I had never experienced before. Not my favorite, but not terrible, and fun to say we tried. We probably ate half of it. Primo: Rigatoni con la pajata. Here's where you really should stop reading if you have a weak stomach. 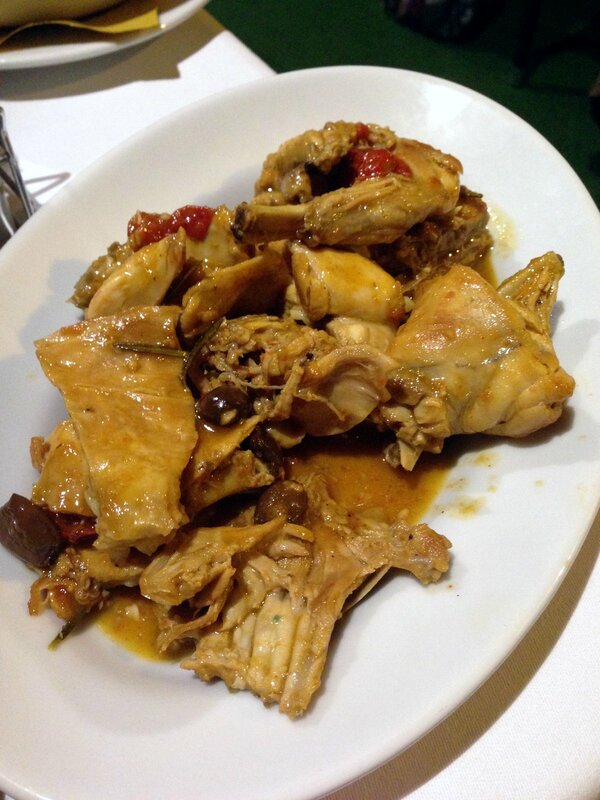 This is one of the classic dishes of cucina povera. 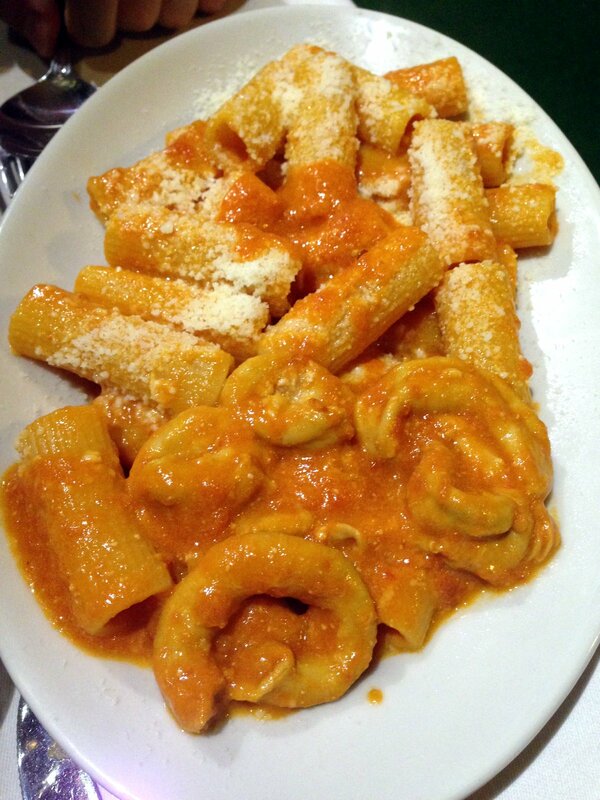 It's rigatoni in a tomato-based sauce made with...the intestines of a suckling calf or lamb. The contents of the small intestine give the sauce a creamy consistency. Yep. Not gonna lie, it was hard to get past the thought and look of this. But you know, it actually wasn't bad. The sauce was delicious. The pieces of pajata were a little difficult texture-wise, but when you ate them with the rigatoni and didn't think about it, they were hardly noticeable. We honestly polished this off. We figured we should order at least one thing we were pretty sure we would enjoy, in case we didn't like the first two courses. Coniglio is rabbit, so this was still something different, but not so far out there. I'd heard of "cacciatore" back home, but didn't really know what it meant; I later learned that cacciatora is Italian for "hunter." I can't find any actual guidelines for what ingredients belong in meat prepared alla cacciatora; it seems to vary but often includes things like onions, herbs, tomatoes, olives, and wine. The color here is kind of off because I had settings messed up on my camera, but this was really wonderful. We ate every bite, and then finished off the meal with an insalata mista (a basic mixed salad: romaine lettuce, radicchio, tomatoes). Interestingly, at every restaurant where we ordered salad, in lieu of pre-made dressing they served a bottle of olive oil, a bottle of balsamic vinegar, and salt. That's how you dress an Italian salad--very simply. I mentioned other disturbing experiences; we had two worth noting which had nothing to do with the food, nor were they completely unique to this restaurant. First, while we were eating our insalata nervetti, a cat walked over to our table and sat there staring at us. I am *not* a cat person and it creeped me out. And lest you think that this was just a stray cat off the street that had wandered into the outdoor dining area unbeknownst to the staff...when the host saw me giving the cat the side-eye and then caught my eye himself, probably noticing my distaste, he called the cat over. It left us alone while we ate the pajata but apparently also liked rabbit, because it came back to stare at us again while we ate our secondo. Seriously? This was our only cat experience, but while we ate in at least one other restaurant, patrons brought their dogs inside with them. Not service dogs. Just pets. And no one blinked an eye. The other strange experience was our being harassed by a man trying to sell roses. He came into the patio area and aggressively tried to convince every table to buy roses, which no one did. But he just would not leave us alone. After we tried to refuse several times, forcefully, he ended up leaving two roses anyway and acting like it was a gift. That was confusing, but there was a language barrier, whatever--then he returned a while later and demanded money, so we returned the roses instead. It was so obnoxious, and I didn't understand why the restaurant allowed him to bother their customers like that. "Contents of the small intestine" wait what?!? Wow. Also, my friend who lived last year in Barcelona said that people don't even start getting dinner until around 8 there too. And kids are playing on the streets riding bikes and whatnot easily until 11 p.m. I love how varied culture around the world is! The dogs totally didn't bother me at all--I just found it amusing since it would be SO very frowned upon here. But cats tend to creep me out anyway, so the one staring us down while we ate was too much!